Logiton may follow strict rules, but nevertheless it seems like there’s always a lot of trouble there. Hopefully the team can continue to help out. The Logiton Police Chief has been abducted by Non Sequitur, the international ring of crime and illogic which has a base of operations in town. He’s been confined in an empty room with nothing but five doorways all in a row on one wall. Being a lock expert, he would just pick one of the locks and escape, except he knows that Non Sequitur may have booby-trapped some of the doors. There’s a sign on each door left to right as follows, but at first the Chief can make no useful conclusions from them. Door 1: This door has a trap and the sign on the rightmost door is false. Door 2: The door to the left of this one has a trap or the door to the right is safe. Door 3: An even number of doors have traps. Door 4: The rightmost door has a trap and the second or third door from the left is safe. Door 5: The adjacent door is safe and the leftmost door has a trap. Fortunately, the Logiton Police have someone on the inside in Non Sequitur, and glean the following reliable information, which they relay to the Chief via his secret badge radio: the sign on a safe door may be true or false. The sign on a booby-trapped door next to a safe door is true, and the sign on a booby-trapped door only next to other doors with traps is false. 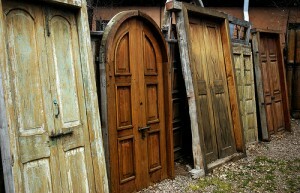 Which door can the Chief now be certain is safe? Let N be the number you get by taking the first three digits of the answer to last week’s Tee Party in sequence. (For example, if the answer were 3142, then N would be 314.) Make a diagram consisting of a rectangle of N dots with m rows and n columns, where 1 < m < n. Place the dots at integer lattice points in the plane, starting from (0,0) and proceeding up and to the right (so there would be dots at (0,1) and (1,0) and (1,1) and so on). 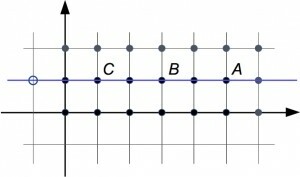 Performing a “slingshot” on this diagram consists of choosing a line in the plane and three dots A, B and C in order on the line so that distance AB = BC, and then adding a fourth dot to the diagram on the selected line, so that the new dot is the same distance from C as B is from C. For example, you could choose the line y=1 and the points A=(5,1), B=(3,1) and C=(1,1), and slingshot to (-1,1). In the accompanying illustration of the diagram and a slingshot, the position of the newly added dot is shown outlined in blue. Subsequent slingshots may use dots added in earlier slingshots. 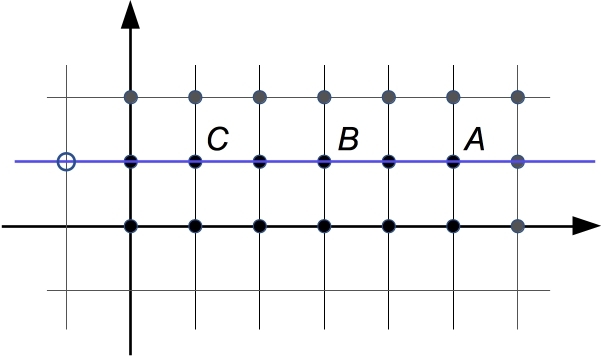 What is the greatest x-coordinate of any dot that you can add to the diagram using three slingshots along three different lines? Design Data. Let’s say the logo area is `h` centimeters high by `w` centimeters wide. We’re told that `2(h + w) = 50` and that `sqrt(h^2 + w^2) = 5sqrt 17`. We want to know what the area `hw` is. But `hw = 2hw//2 = ((h + w)^2 – (h^2 + w^2))//2 = (25^2 – (5 sqrt 17)^2)//2 = (625 – 425)//2 = 100`. So the logo area is 100 square centimeters. Look at what we did in that problem. We figured out the area without ever calculating the height or width, by directly calculating their product. In this case it would have been possible to find the height and width, but sometimes it’s not even possible. So don’t make extra work for yourself — when you can go straight to the answer, go for it!